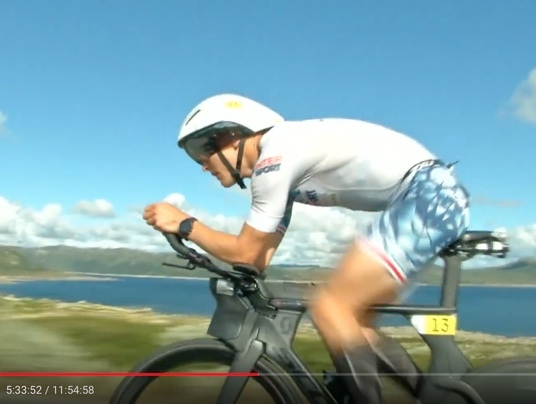 The bike part of this years Norseman was the most fun bike part I had in a race ever! I was close to my toughest competitor, Lars Christian Vold the whole time and had the battle against each other that I wanted. When we arrived at Geilo, 90 km on the bike course, the cat and mouse game started. I was slightly faster going uphill and took the lead while LC was slightly (ok, sometimes a lot) faster going downhill and regained the lead. What happened? Why was I faster going up and LC faster going down? In cycling, it is common to categorize how good a rider is in how many watts they produce at threshold per kg, w/kg. While this is not irrelevant, it is not the most relevant, especially in triathlon. The watts pushed in correlation how much aerodynamic drag, CdA, is what really matters, and weight is a much less important factor. If we take the relatively flat course in Ironman Barcelona a 10 % decrees in drag will save me 8 minutes. If I lose 10 % bodyweight it will only save me 2 minutes. That’s why you should prioritize aerodynamic before weight. When going uphill, however, instead of using 80 % of your power to overcome air resistance, you use the similar percentage to move mass, you and your bike, upwards. The steeper the more percentage of power is used for that purpose and less for overcoming air resistance. 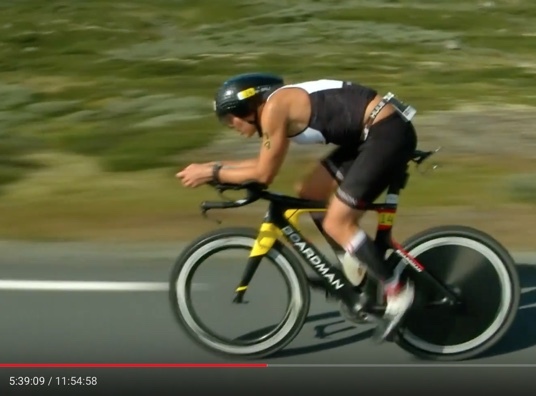 For those reasons above the calculations form Ironman Barcelona looks very different for Norseman. 10 % less drag would save me 6 minutes and 54 sec. 10 % less weight would save me 7 minutes and 44 sec. If you compare LC Vold against me the FTP, watt/kg at threshold is pretty similar. But he is roughly 10 % heavier. While I edged him in the uphills, simply by pushing a few watts more adjusted for the weight, the heavier weight is an advantage going downhill. If I would gain 10 % weight in the 10 km long downhill to the foot of Imingfjell I would gain 11 sec. Not a lot, but faster. For that reason, LC should be riding faster than me downhill. He is better known on the course – He has a cabin in the area and train at least a few weeks in the year on the course. I usually ride it ones a year, but actually had a training day there before this year. He is better than me technically going downhill. His aerodynamic in super aero position, the position when you are sitting on your downtube, is far better than mine. And if there is one course when you can be a lot of time in that super aero position it is Norseman with its long non-technical downhills. 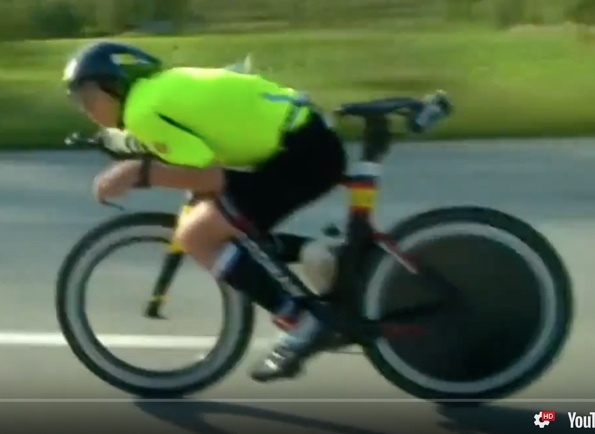 LC has Morf-Tech aerobars which allows him to nearly lick his front wheel. He gets very low in this position. I have my head much higher. It is not by choice, but my aerobars and drinking bottle prevents me from getting lower. This is a video from when I passed him on the flats at some point on the course. It looks like he is much more narrow and has his head lower. This is just a screen shot, and I have my head higher than usual to have control of the motorcycle with the camera. I do not believe it is representative but LC is sitting really good. This is LC when passing the final plateu after Imingfjell. Looks good, but even better when he puts his head down. My own position from the same plateau. It does not look so bad either, but I believe it could be done better. What to see LCs downhill riding in action? Takes a look at the video below. It takes a while but after less than 3 minutes he passes me. Her you can see the pass and difference in speed. My highest recorded speed in Norseman was 93,3 km/h while LC had 99 km/h.